I recently collaborated with great friends and next door neighbors West Kill Brewing on a beer label for their brand new IPA called Kaaterskill. 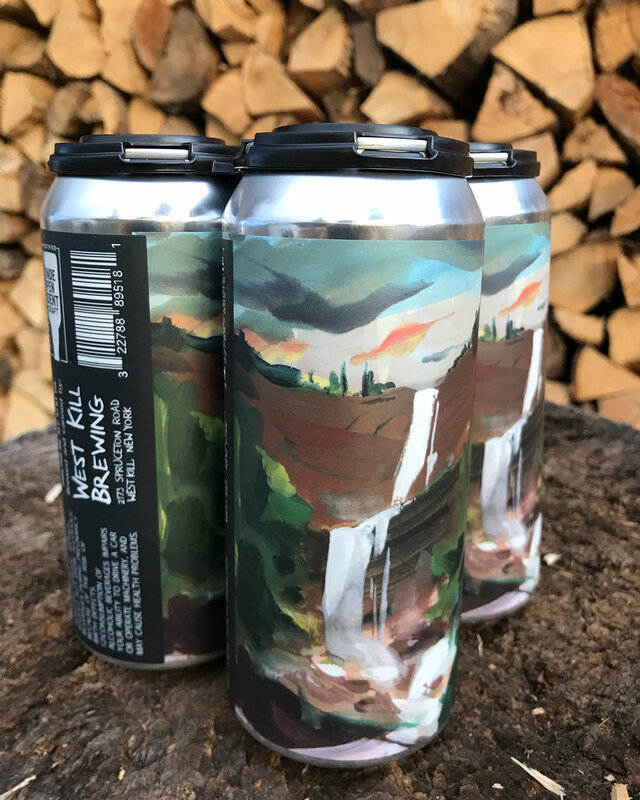 When Mike (who co-owns the brewery with his wife Colleen) asked me a month or so ago to paint an image of Kaaterskill Falls to go on the can, I knew it wasn’t just a casual ask. As much as Mike is a brewer, he is also a historian and someone who grew up in the Catskills. 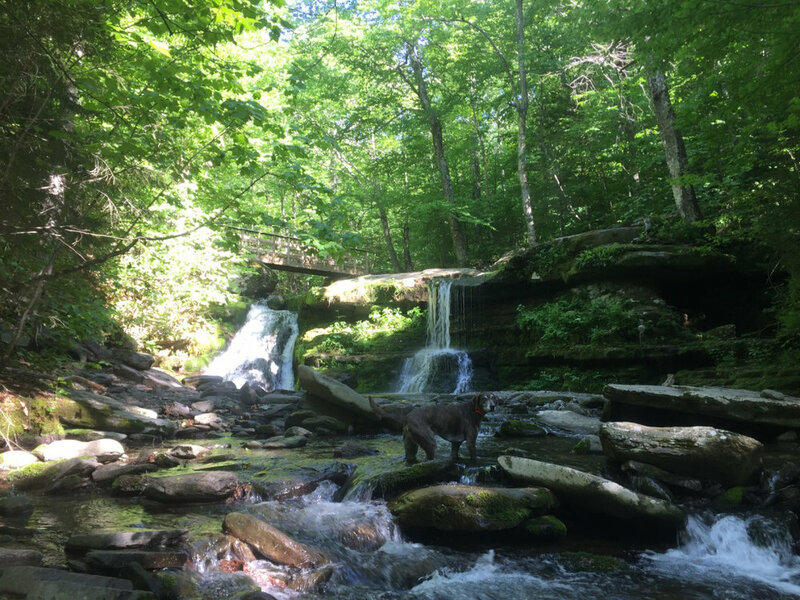 Kaaterskill Falls is arguably the most famous vista in these mountains. They’ve been painted by a lot of my favorite Hudson Valley School painters too. In other words, it was a very very very daunting request. But also a great excuse for me to take on a landscape I’d frankly been afraid to even consider painting. The falls became further iconic as tourists flocked to the Catskills and painters flocked to Thomas Cole to learn from him. Probably the most famous image of the falls was painted by Asher Durand. It’s of Thomas Cole and the poet William Cullen Bryant discussing probably really light stuff like the sublime and the nature of environmental devastation, poised in front of the falls in the distance. The painting seems like an absurd bout of mansplaining now, but when it was painted it represented a sort of eulogy to the recently deceased Cole and a visualization of the philosophy of the Hudson River School itself. I like those two painters and paintings a lot. It’s hard to think I could really take a stab at this in a brave new manner and I don’t know, add to the canon… Or more likely stand a couple miles away from said canon. Which is all why I did kinda love this ask. It was just for a beer can! No pressure, right? I also wanted a more dramatic sky above the falls. Again, lucky for me, our adorable 16 month old Amina has granted me a heaping ton of sunrise views over the past sixteen months so I had a lot of memories and photos to work with. Of course at a certain point, I had to just paint the damn thing. Sometimes I’ll sketch a lot and fret over a ton of details. Sometimes I just say f*** it and paint. This was my first go. I did not like my first go. The thing about watercolor painting is it is does not reward second-guessing. The other thing about watercolor painting is, at least for me, you really only learn from your own mistakes. (Which is why I’ve had a hard time imagining how I could teach anyone watercolor painting when I’ve been asked.) I knew the white could pop if I let it stay thick and opaque enough. The sky was going to have to do more to balance out the fury of the falls. I couldn’t overthink the tree line up top. The mist was either going to work or it wasn’t. Basically I just had to let go and trust the paint to do its job. I tried to “correct” too many things on this painting while I was painting it. To me, at least, that shows. So, having hopefully learned something, I painted it again. I like to think this one works. It’s been really flattering hearing the positive responses this painting. In a lot of ways it feels like a culmination of spending the past five years painting the mountains in my backyard. And, as I said, beer label or not, it was a daunting project to take on. I enjoy drinking the beer inside the can much more than the process of making it! As of writing this, cans are still available at West Kill Brewing’s taproom. And I’m selling 11” x 17” prints of the painting on my site’s shop here. They’re also available at the brewery’s taproom and the bar of the Spruceton Inn.